This weekend’s World Superbike round at Phillip Island will see tributes to the late Barry Sheene from both the organisers of the event and the riders. Sheene was a regular at the circuit racing every year in the Annual Island Classic race regularly winning the event, so circuit owners, Phillip Island Motor Sport, have organised a tribute lap. The 1961 500cc Manx Norton that Sheene used for the Island Classic, and many other events, will be brought to the track from the Gold Coast and ridden in a lap of honour by Mike Farrell before the racing starts on Sunday. The bike, which Sheene took to a new Classic 500cc lap record in 2002, will be pitted in the No7 garage until the tribute lap at 11am. Fergus Cameron, Managing Director of Phillip Island Motor Sport, said: " We have many great memories of Barry. He has done so much for motorsport in this country. He just loved to race and fans at our January historic meeting were always treated to a great showdown when he competed here. 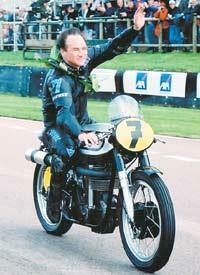 His love of racing, his ever competitive spirit and his unique humour will always be remembered. " British WSB riders Neil Hodgson, Chris Walker, James Toseland, and James Haydon will offer their own tribute to the former world champion by wearing black armbands at the race. And WSB bosses will present a cheque for $5000 (£3100) to a representative of the Australian Cancer Research campaign.